MONTREAL, QUEBEC--(Marketwired - Feb. 10, 2016) - Dynacor Gold Mines Inc. (TSX:DNG)(OTC:DNGDF) (Dynacor or the Corporation) is pleased to release the final exploration results on the Manto Dorado Raise-215 and its lateral extensions at Tumipampa. Average gold, silver and copper grades found in the Raise and its extensions are reported in Table 1. Raise-215 has a total length of 83 meters an average true width of 1.18 m grading 18.56 g/t gold and 1.33% copper. The new channel sample data include new high-grade gold channel samples grading 66.14 g/t Au and 1.61 % Cu over a true width (TW) of 1.0 m; 19.32 g/t Au and 0.55% Cu over 1.8 m (TW) in the Raise; and 42.16 g/t Au and 1.0% Cu over 0.45 m (TW) and 33.38 g/t Au and 1.83% Cu over 0.7 m (TW) in the lateral NS sub-level extensions (see Figures 1,2 and Tables 1,2 and 3). This press release covers new channel sampling data in Raise-215 and in lateral sub-level NS extensions. Previous data on Raise-215 were published in two press releases dated: Oct. 8 and Nov. 12, 2015. Raise-215 has been extended by 18 m (see Tables 1 and 2 and Figure 1). Its total final length is 83 meters over an average TW of 1.18 meters grading 18.56 g/t gold and 1.33% Cu. Within the 18 m length there are two segments: one 6-m segment that is high-grade with an average TW of 1.37 m grading 15.5 g/t Au and 0.55% Cu and a second 12-m long segment grading 2.667 g/t Au with an average TW of 1.13 m. Individual high grade channel samples include: channel sample #10864 grading 66.14 g/t Au and 1.61 % Cu over a true width (TW) of 1.0 m; and channel sample #10873 grading 19.32 g/t Au and 0.55% Cu over 1.8 m (TW) and finally channel sample #10866 grading 10.44 g/t Au and 0.16 % Cu over 1.3 m TW. The complete data for all the 19 channel samples is given in Figure 1 and Table 2. 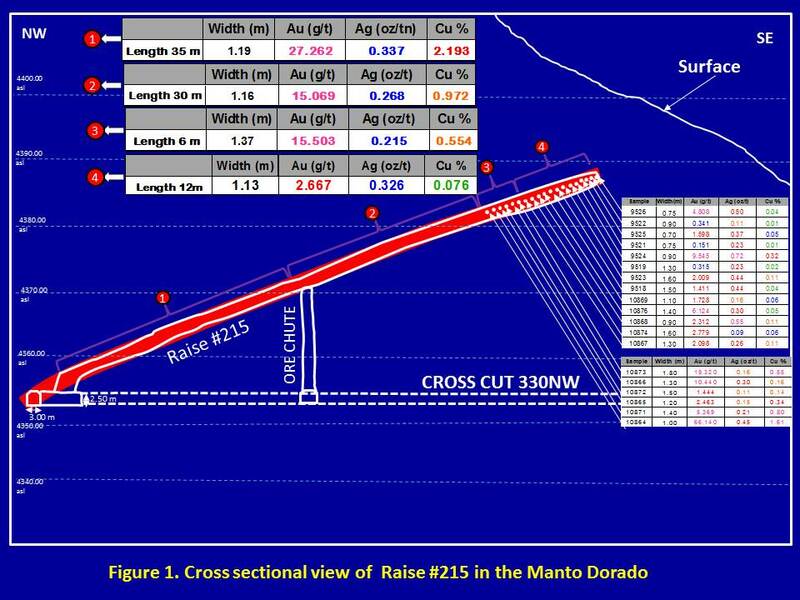 As shown in Figure 2, a 40-meter long lateral drift has been excavated from the 51-meter mark in the raise following a SW to NE orientation to study the lateral extension of the gold and copper mineralization. Sub-levels 215 NE and 215 SW are shown in Figure 2 and the channel sampling results in Table 3. Within the 40-m lateral sub-level extension there are two zones: one is a 29-meter long high-grade segment grading 7.612 g/t Au and 0.4% Cu over an average TW of 0.63 m and the second 11-meter segment is less mineralized grading 0.525 g/t Au over a average TW of 0.73 m. Individual high grade channel samples include: channel sample #11333 grading 42.16 g/t Au and 1.0% Cu over 0.45 m (TW), channel sample #11101 grading 33.38 g/t Au and 1.83% Cu over 0.7 m (TW) and channel sample #11102 grading 32.19 g/t Au and 1.37% Cu over a TW of 0.75m. The complete dataset for all the 45 channel samples taken in the sub-levels is given in Figure 2 and Table 3. 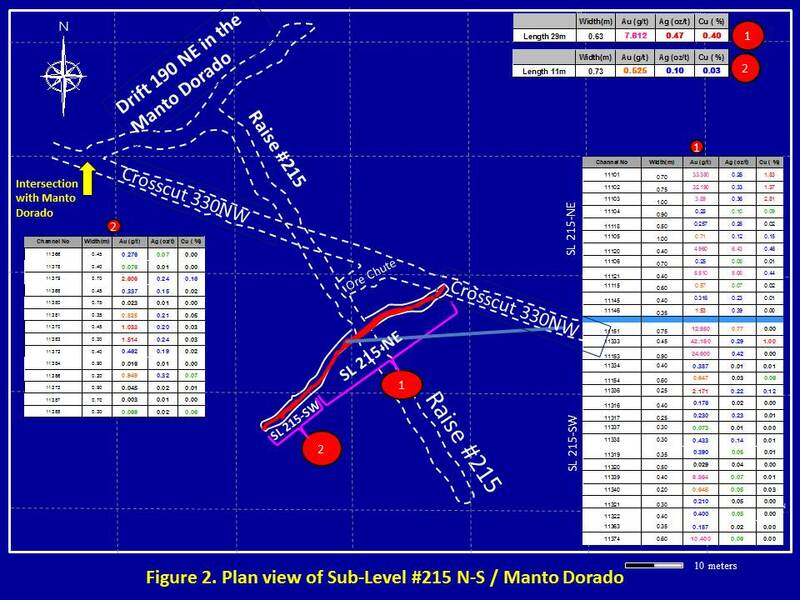 Alonso Sanchez, Dynacor Chief Geologist recently stated "The results we have obtained on Raise #215 are very exciting since they demonstrate unequivocally that high gold and copper grades are encountered in the Manto Dorado and its associated structures. They also demonstrate the great advantage of underground exploration in this type of mineralized system as compared to drilling. Further results are pending on other structures and will be published in due course"
The samples are sent to the internationally certified laboratory Certimin S.A. for analysis. Standards, blanks and duplicates are used in the sampling process as part of the QA/QC that is implemented and followed by Alonso Sanchez, Chief Geologist for Dynacor Gold Mines, B.Eng. This Press Release has been read and approved by Alonso Sanchez, P. Eng. and Chief Geologist for Dynacor Gold Mines. He acts as the qualified person ("QP") for the Company and is a geologist affiliated to the American Institute of Professional Geologists (AIPG). Dynacor is a gold ore-processing and exploration Corporation active in Peru since 1996. The Corporation differentiates itself from pure exploration companies as it generates income from its wholly owned ore-processing plant. Dynacor's basic share count at 37.4 million outstanding is in the lowest quartile of the resource sector. The Corporation's assets include three exploration properties, including the advanced high-grade gold Tumipampa property and an operating 85.000 TPA gold and silver ore processing mill at Metalex-Huanca. The Corporation obtained its permit to construct a brand new 300 tpd mill in Chala Peru. This represents an important milestone for the Corporation's future growth. The Corporation's strength and competitive advantage comes with the experience and knowledge it has developed while working in Peru. Its pride remains in maintaining respect and positive work ethics toward its employees, partners and local communities.